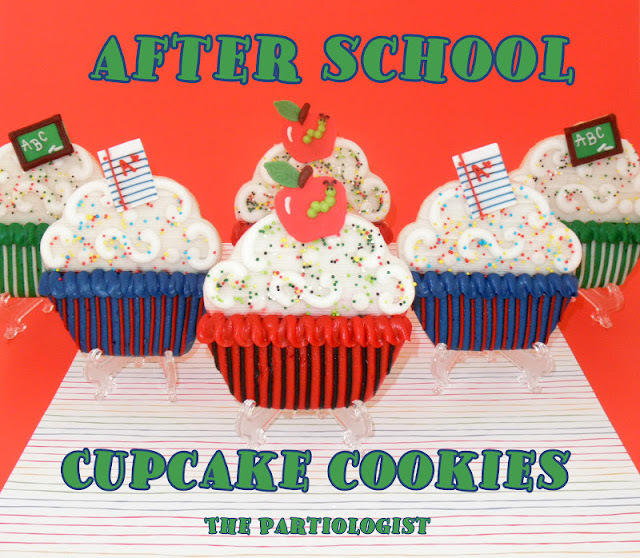 The Partiologist: After School Cupcake Cookies! I realize all my "Back to School" ideas may be coming after you've sent your kiddos back to school and that's why I'm cramming them all in one week, I hope you don't mind. Just think of it as finals week and you'll be good to go! After making the Cupcakes, I decided to make Cupcake Cookies too. Wouldn't your little one (or grown one) be pleased if you had one of these waiting for them when they came home from school? So if you would like to make them, here's how. These are the fondant toppers I made using a rectangle cutter and a little apple cutter. Piped on the decorations. After baking the cookies, I piped on frosting using a #9 tip, cleaned the edges and added another stripe with a #4 tip. Pipe white frosting across top of cupcake using a #46 basketweave tip. Clean the edges and added a red ruffle with the #103 tip. Add some swirls with #9 tip and sprinkle coordinating non-pareils on the white frosting. Add another dollop of white frosting to the top and placed on the fondant topper. 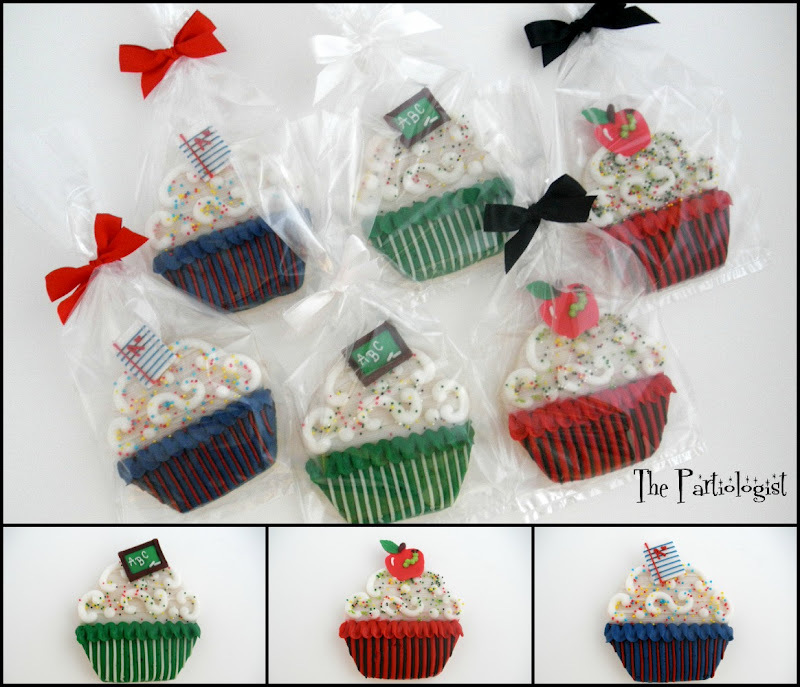 Package in bags with coordinating ribbon! Can I live with you?? I never got great treats like this after school! They look fantastic!! These are so fun. How do you come up with all these fantastic ideas!? The good thing about after school treats here is that I don't have any kids living here anymore so I get all the treat's myself!!! Can't get over the cuteness of those pad paper & chalkboard fondant toppers! Aw, thanks for the sweet comment! Your cookies really do look like cupcakes topped with fluffy frosting. I love how you created that effect on the cookies and your fondant decorations get an A+.